Ganozhi paste contains high quality ganoderma, food gel, menthol and food flavouring. It does not contain fluoride, saccharin and artificial colouring. It cleanses your teeth, leave your mouth with a pleasant smell and makes your teeth brighter and gums healthier. DXN Ganozhi Toothpaste contains high quality Ganoderma, foodgel, menthol and food flavouring. It does not contain fluroide, saccharin and artificial colouring. It cleanses your teeth, leaves your mouth fresh with a pleasant smell and makes your teeth brighter and gums healthier. - DXN Ganozhi™ Toothpaste contains no saccharin and coloring but with high quality of Ganoderma extract, food gel, menthol and food flavoring. - The Sentry at Mouth – Prevents all kinds of Oral Infections. - Prevents Bad Breath – foul smell. - Relieves from Tooth-aches and Tooth Sensitivity. - Relieves from Oral Ulcers and Gum Bleeding. - Keeps mouth fresh all thru the day. 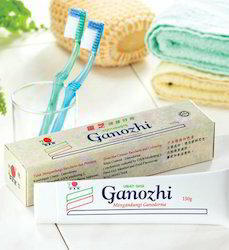 DXN Ganozhi Toothpaste contains high quality Ganoderma, foodgel, Menthol and food flavoring. It does not contain fluoride, saccharin and artificial coloring. 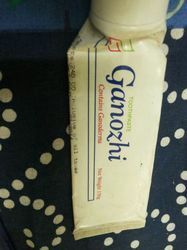 DXN Ganozhi Toothpaste contains high quality ganoderma, food gel, menthol and food flavouring. It does not contain fluoride, saccharin and artificial colouring. It cleanses your teeth, leave your mouth with a pleasant smell and makes your teeth brighter and gums healthier.